Norovirus is a virus that's a common cause of infectious gastroenteritis that results in diarrhoea and vomiting. Since it's most common during the winter months, norovirus is sometimes known as the winter vomiting disease, but infections can occur at any time of year. It's important to wash your hands, particularly after contact with someone who is ill, after using the toilet and before preparing food. To find out more about norovirus and how to stop it spreading, visit the NHS inform website. 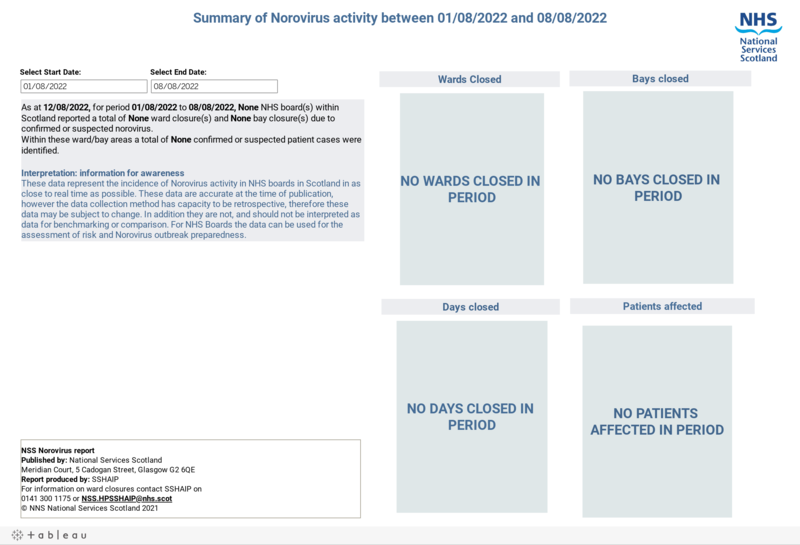 NHS Boards report to us all ward and bay closures due to norovirus including number of patients and staff affected and length of outbreak. These figures are added to an ongoing dashboard where you can see figures by board and date. For this year’s norovirus seasonal awareness campaign, Health Scotland have developed some resources for organisations and individuals to help them spread the message. The toolkit can be downloaded from the NHS inform website.